I'VE never been a good runner. And when I left the District back in November 2016 I wasn't running at all. Well, maybe once or twice a week. The truth is, I had given up. I had given up on myself. During the summer leading up to leaving the city, it seemed like every single thing in my life had taken priority over my running. The nights I would have normally spent running the neighborhood just to make sure I was getting out there were replaced with writing emails and spending late nights in the office. Later nights on the couch resulted in late starts to the day. It was a cycle I needed a change. Flying in to a war zone 7,000 miles away probably isn't at the top of any list of ideas to break that cycle — but it happened. These days, the miles come before the emails. And in a war zone, I found power in the preparation. "Ok, water bottle, check. Pre-workout snacks ready to go. Shoes? Socks. Wait.. where are my socks?" It's 11:02am, and I'm all out of energy after a 14-hour shift at the office. I need to wake up again in six hours to have enough time to get my run in before work. Part of breaking the cycle I'd wound up in before getting to Afghanistan was preparing for a run with time and intention. Set my clothes out the night before; find a system that works. Socks, inside the shoes by the door. A small snack next to a bottle of water for some pre-workout energy. Headphones charging, double check! Some days It felt like I had all the time in world and getting ready for the wake-up seemed pointless but in those moments of "whatever" I'd remind myself about the cycle and the giving up on myself. I wasn't going back there. "but in those moments of 'whatever' I'd remind myself about the cycle and the giving up on myself. I wasn't going back there." There were mornings I'd wake up and think to myself, "Why did I ever give up in the first place?" Now, sure some days It's ok to just stay in bed and rest. It's ok to run only 4 miles instead of 5. But after a year of being intentional with my preparation, I'll never again turn a rest day into a week of staying in bed. That planned five-mile run won't ever again become "well, two is fine." While the starting & final numbers aren't relevant, the number that matters the most to me is 25. Not falling back into that trap. Not letting the cycle wind its way back up and spiral my progress out of control again, I found myself 25lbs lighter a year later. Going in to it and figuring out what preparation to me looked and felt like, there was never a "I'm gonna lose..." moment or thought. No: instead, it was a life change goal. I could have lost half that and I'd still feel great about the progress I made. No pound lost could ever weigh more than what I gained mentally. You can't weigh mental health. 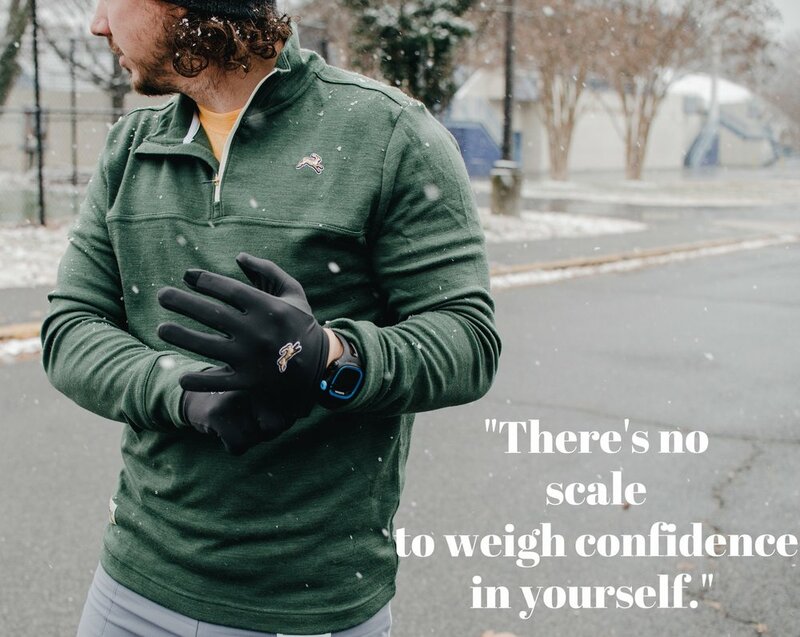 There's no scale to weigh confidence in yourself. You just feel it. Before every long run or even a morning run around my neighborhood, I plan ahead. Clothes set out the night before. Coffee grinds ready, water ready to be boiled. Every step of my morning is laid out the night before. And unlike pre-Afghanistan days, I plan for the after. I know the value of time. I know how much I missed the little moments. I try not to waste them now. So, in my run bag goes an extra t-shirt for the after. No more sitting it wet clothes or letting the end of my run be the end of my day. When asked "Are you a runner?" I always thought I was supposed to say "No." I've never run a marathon. I don't know anything about my PR stats. I don't know who's who in the running community. There were all these reasons that went in to that "No," but that's changed. In a war zone far away from home, I became a runner. And most importantly, I became a runner for myself. It was in the walks to the gym with commute shoes on and my running shoes in my bag on the other side of the world that I finally realized what being a runner meant to me. I realized just how much the paths and roads I ran on when I never felt like a runner were the roads and paths I missed the most. The paths I took for granted once before and let go unexplored were the same ones waiting for me when I was too busy giving up on myself. No longer would I take them for granted. No longer would I give up on myself. While I still may not know who's who, I know who I am better than I have before. Today I wake up a runner that runs for no one but myself. Today, and every day going forward, I refuse to give up on myself. Life becomes a whole lot easier when you believe in yourself. Here's to re-introducing myself to those roads that were always there for me. Here's to the miles to come.